When a solution to your own problem presents an opportunity for your employer. Prior to moving to the PNW I was a loyal Southwest Airlines flier. They offered the best balance of price and routes from Houston. I decided to sign up for their credit card the year leading up to getting married and earned 110,000 Rapid Reward points to qualify for Companion Pass which was quite a feat. In addition to the signing bonus and putting a lot of our wedding expenses on the card, the biggest aha was utilizing the mileage mall for everyday purchases. The mileage mall is a shopping program often offered by airlines, hotels and credit cards, amongst many others probably. Start your shopping on the shopping portal, then click through to retail sites and earn X miles/points for every dollar spent, regardless if you are using the partner credit cards (though it helps multiply your earnings). Tip: there are sites like http://evreward.com/ that you can visit that list earning potential from various programs. Not helpful if you are trying to reach a certain goal with a single program. Plus, if you could remember to go here you can probably remember to visit the program's shopping portal. 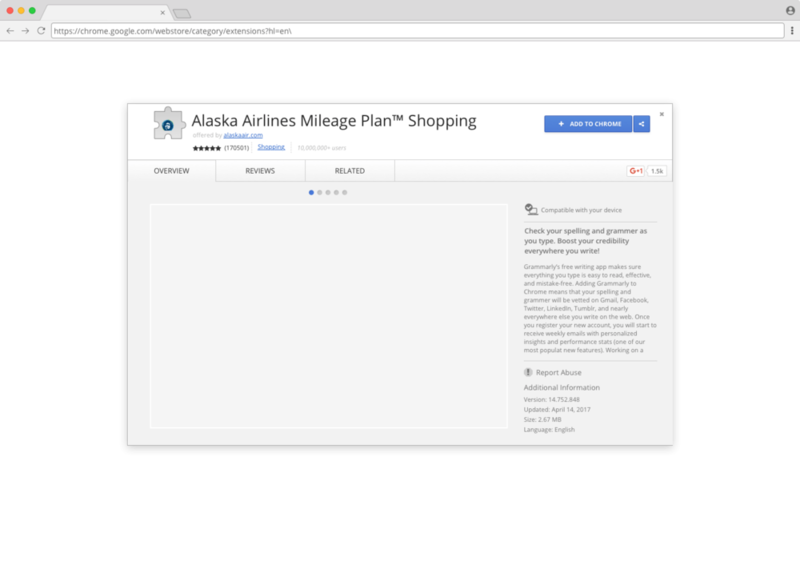 EDIT: I learned that in the Spring of 2018 Alaska Airlines published a Chrome extension rooted in the same concept. Unfortunately, I don't think my concept contributed to that decision. Start by searching the Chrome Web Store for the extension. Or, perhaps you landed here from a landing page on the alaskaair.com website. After you've added the extension to your browser you're redirected to a sign in page to connect the extension to your Mileage Plan account. Now every time you visit a site that offers a reward you'll receive an alert. Then, you can enable the bonus thereby earning even more Mileage Plan points. Watch the idea come to life in this screencast of the clickthrough prototype built in Invision.